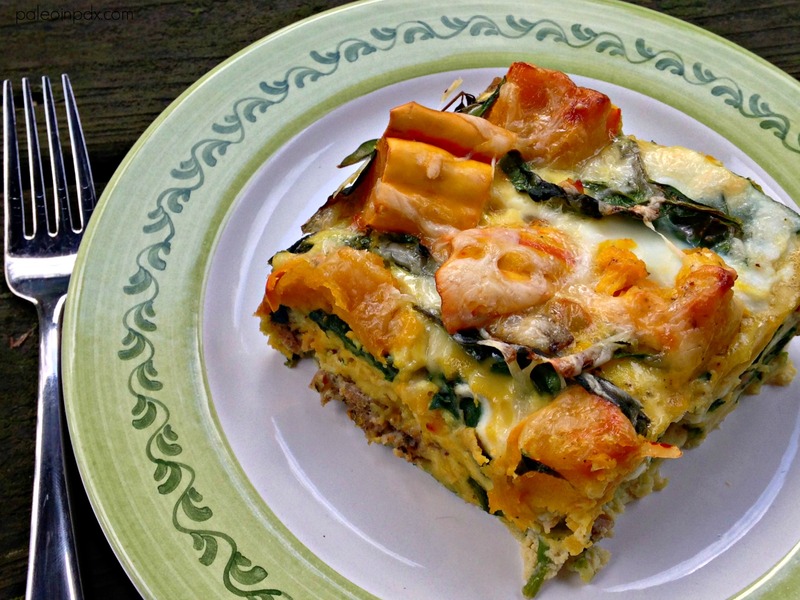 My husband and I ate this sausage, squash and spinach egg casserole Christmas morning and both thought it was spectacular. I threw it together that morning and while it baked, we enjoyed coffee and opened some gifts from our family. It was just us on Christmas and it turned out to be a quiet, but enjoyable day. We were both okay with quiet and hanging out at home since we were recently traveling in Hawaii. Meanwhile, when I made this recipe, I was fortunate to have half of a roasted delicata squash leftover in my fridge, but if you don’t have any leftover, here’s what to do: cut the squash in half, scoop out the seeds and place in a baking pan cut-side down. Fill the pan with about 1/4″ of water and bake in a 350 degree oven for 45-60 minutes. Anyway, I hope you all had a lovely holiday that was filled with joy. I wish you all a happy New Year! Preheat the oven to 375 degrees F. Melt the butter in a large skillet over medium heat. Add the ground breakfast sausage and break up with a spatula. Continue to cook for about 5-7 minutes or until meat is browned, stirring occasionally. Place the spinach in the bottom of a 9×13 pan (note: you may need to grease your pan with a little butter before adding the spinach. I used a stoneware baking dish that doesn’t stick, but if you’re using glass or stainless steel, I’d recommend greasing it). Stir the sausage into the spinach and make sure it’s evenly distributed. In a large bowl, whisk together the eggs, coconut milk or heavy cream, bone broth, sea salt, pepper, garlic granules, onion granules and nutmeg. Pour egg mixture on top of the sausage and spinach. Then, evenly distribute the squash pieces on top and sprinkle on the cheddar cheese, if using. Bake for 30-40 minutes or until eggs are cooked through. 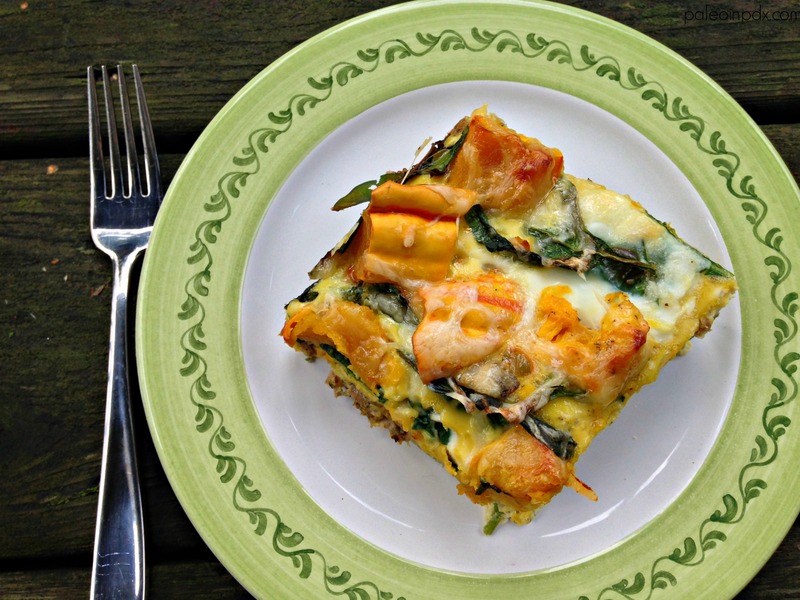 I haven’t made a frittata in a while so this gives me a great idea for New Year’s day. Can’t go wrong with sausage and eggs and the squash sounds great with it. I’d also like to try and do the whole thing in my cast iron skillet! Yes, you could definitely do this in a cast iron skillet if you have one that’s large enough. I’ve made frittatas in mine in the past and it always works quite well. Meanwhile, happy New Year, Paula!